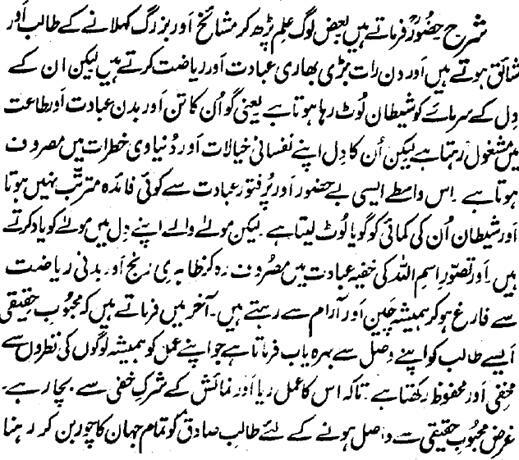 Hazrat Rahmatu-Allahe Ta-aala Alaihe says that some persons are desirous and Seekers to be called Saints and Sheiks and day and night do very heavy worship and Riyazat but is looting the asset of their hearts. That is, though, their body is busy in worship and obedience but their heart is engaged into its sensual thoughts and worldly Khatraat. That is the reason that such worship, which is devoid of Hazoor and is filled with corruption yields no gain and Satan robs their earnings away. However, the People of Lord remember Lord in their hearts and by engaging into the secret worship of the Visualization of the Name Allah , remain free of Outwardly grief and remain in peace and comfort against physical exertion. In last lines, he says that the Real beloved honors His Wasal upon that Seeker who all the time keeps his Amal hidden and guarded against the eyes of people so that his Amal should remain secure against Riya and the Invisible Shirk. Hence, in order to become Waasil with the Real beloved , the True-Seeker has to act like a thief from the whole world.